What is waterproof Membrane Keypads? 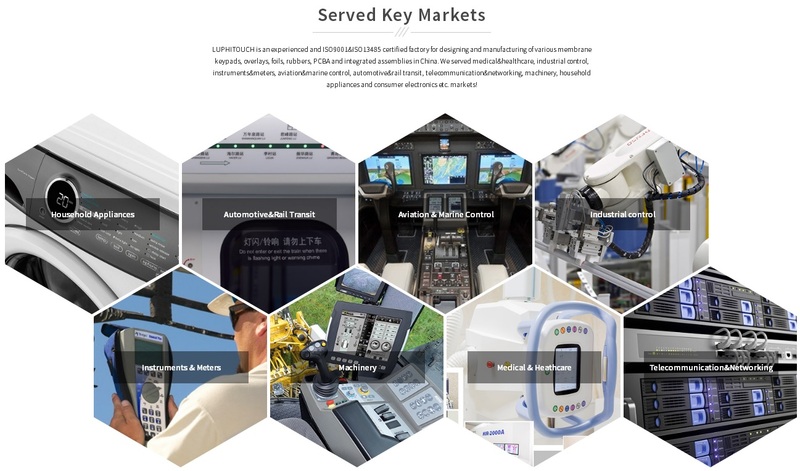 Membrane Switches also called membrane keypads have very widely application and also have many different using environment. For example in wet environment, in outdoor under sunshine UV and bad weather of rain, boat sailing on the sea etc. Then a waterproof and anti-UV membrane keypads are necessary for such kind of special application. 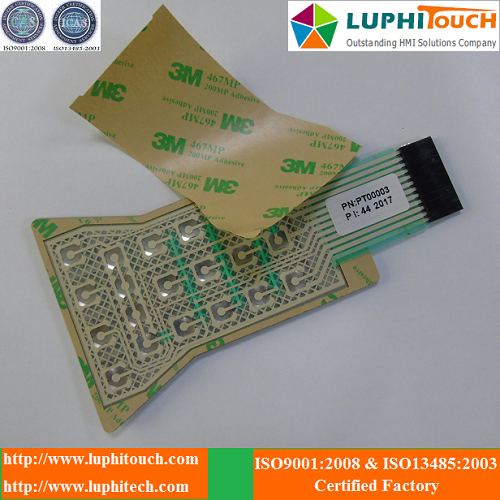 LUPHITOUCH manufactured waterproof membrane keypads can meet IP67 and NEMA-4 waterproof standard. For outdoor using, especially exposed under the sunshine UV, an anti-UV membrane keypads are also necessary. The common membrane keypads can be easily damaged by strong ultraviolet rays. Although no impact to the function, but the graphic overlay will be become ugly and the printed graphics can be faded in a not long time. 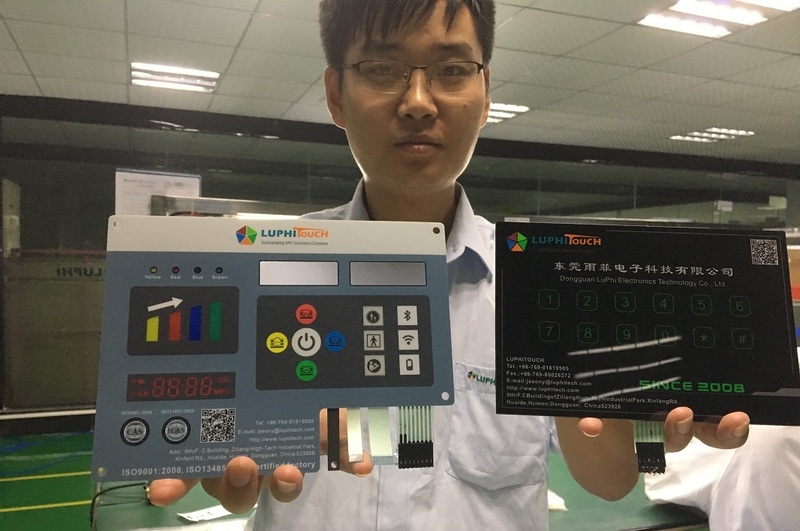 In LUPHITOUCHH we use anti-UV PET materials for outdoor using membrane keypads. For example the Autotex XE series materials. For waterproof keypads, we can design a waterproof frame on the membrane keypads to prevent the water going into the circuit. 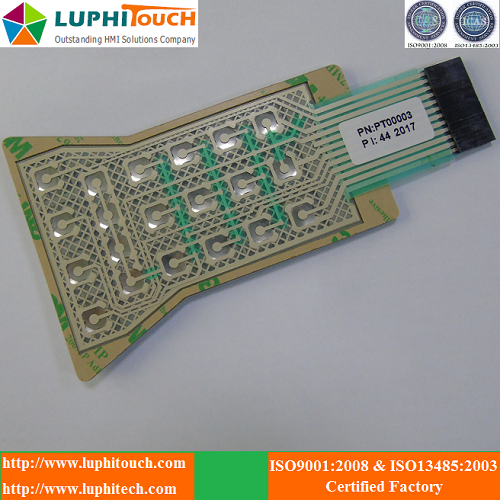 Also can use rubber keypad wrapped the PCB circuit and use seal the connection circle. 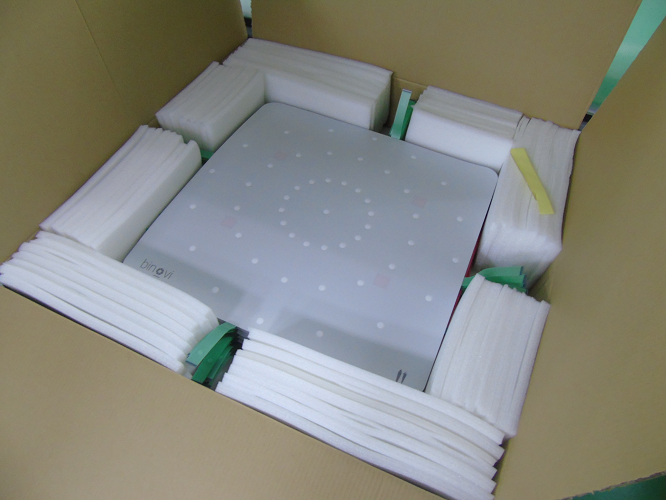 In these special environment application, the anti-UV and waterproof membrane keypads quality is very important. If the water went into the circuit it will cause your control board failure and then easy cause safety accidents. So a good supplier of such kind of membrane keypads is very important for your application. 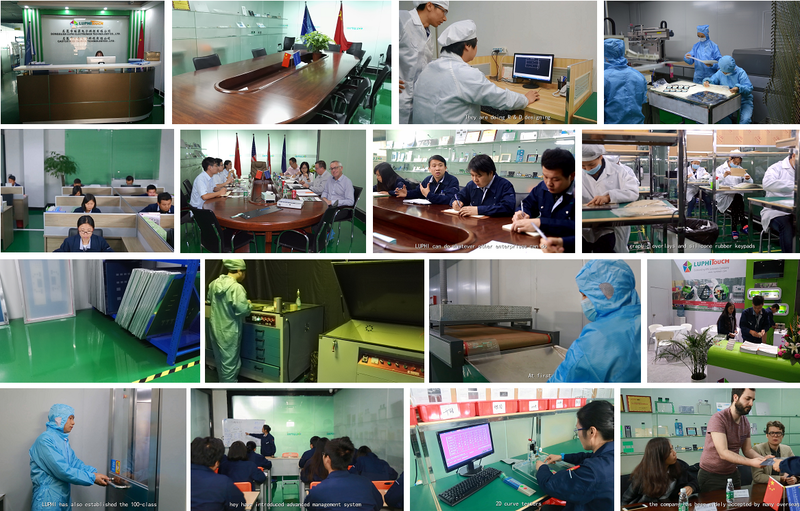 LUPHITOUCH's inner testing room can do the salt spray test, waterproof test, buttons life test, temperature and humidity test etc to assure our manufactured keypads quality. 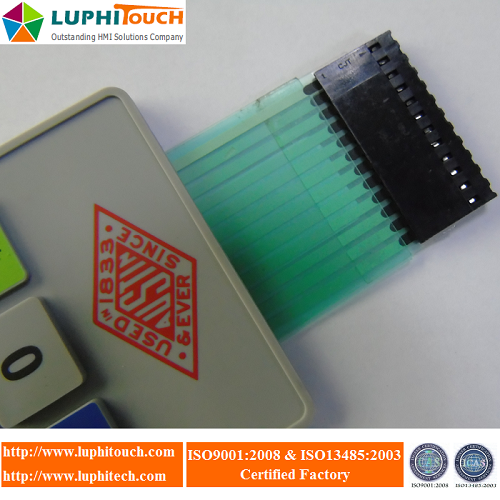 LUPHITOUCHH also is an ISO9001 and ISO13485 certified factory, which can provide you high quality of such kind of membrane keypads for your special using environment. 2.1) How many colors on the graphic overlay layer? 2.2) How many buttons? Are the buttons need embossing or not? Need metal domes or not? 2.3) How many LEDs on the circuit? 2.6) What kind of connector do you want? Female, male or ZIF? If need female and male connector, how many PINs? 3) If have an original sample it also will be good. We can copy the sample to design the engineering artwork drawings. As to the material and components that you are not familiared with, it doesn't matter, we can suggest the proper material as per our experiences. 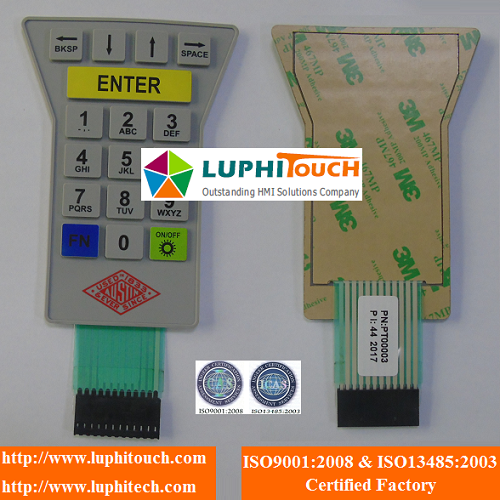 Looking for ideal Rubber Keypad Waterproof Membrane Switch Manufacturer & supplier ? We have a wide selection at great prices to help you get creative. All the Silicone Keypad Waterproof Membrane Switch are quality guaranteed. We are China Origin Factory of Rubber Keypad Waterproof Membrane Keyboard. If you have any question, please feel free to contact us.